The Orbit Dolly is a unique camera tracking device that allows up to 360 degrees of adjustable radial and straight line dolly motion on smooth surfaces. It is designed to be used both with and without a tripod, and can be used in tabletop, normal, and wide modes. 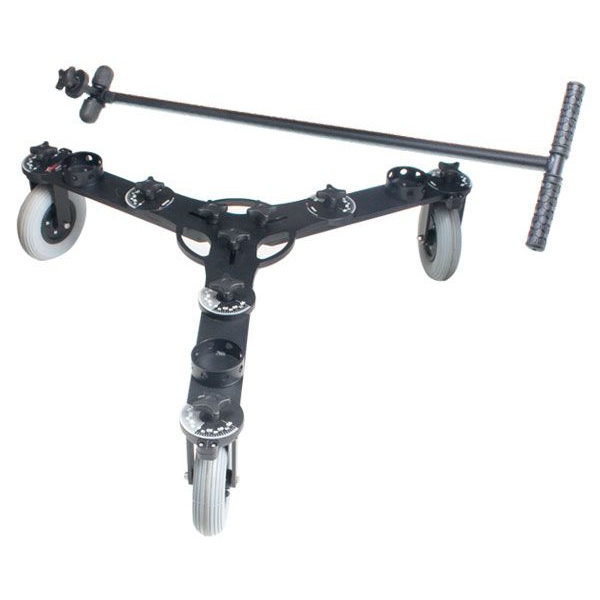 The Orbit Dolly replaces the need for more costly straight and curved tracks. It also quickly converts from a robust floor dolly to a tabletop tracker, providing added versatility and maneuverability in an affordable package. The Digital Juice Orbit Dolly Kit includes hard wheels, soft wheels, and all-terrain wheels. Add track and skates for an additional $20/day.